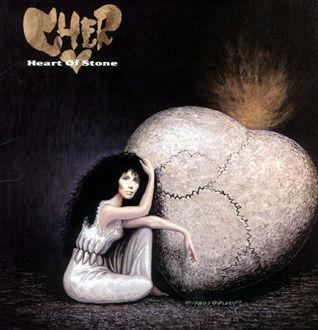 This album cover from Cher's Heart of Stone album is a take on the well known skull illusions - her dress design and pose in the picture help to create the overall impression of a skull. Wow! You really dont get it? Well the middle part of her dress looks like the mouth and the texture of the heart reminds yourself or me anyways of a skull. So there you have it. The illusion. its a skull. there's a lot of skulls in these illusions. Creative and original, I can see Cheer being part of the skull and her name made by pieces of bones forming a heart. I just wonder?. What's the meaning of this picture for Cheer or the Artist ?.